Nicholas Hagger’s Collected Poems contained 30 volumes of his poems that reflect his quest for the One. 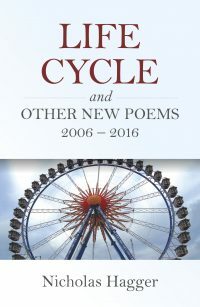 Life Cycle and Other New Poems contains volumes 31-34 and presents the vision of unity to which his quest has led. ‘Life Cycle’ is a reflection on the path and pattern in our lives, and on twelve seven-year ages from infancy to advanced old age. ‘In Harmony with the Universe’ presents poems on the soul’s harmony and oneness with Nature. ‘An Unsung Laureate’ focuses on public events and the conflicts within Western society. ‘Adventures in Paradise’ recounts journeys to remote places that have echoes of Paradise, including the Galapagos Islands and Antarctica – and reflections on evolution and global warming. Hagger derives his inspiration from the 17th-century Metaphysical poets and seeks to unite the later Augustan and Romantic traditions. These poems reconcile the soul’s harmony with the universe and the conflicts in public life, and are within the poetic tradition of Wordsworth and Tennyson. They add significantly to Collected Poems, Classical Odes and Hagger’s two poetic epics, Overlord and Armageddon, also published by O-Books (the manuscripts and papers for which are held in the Albert Sloman Library at the University of Essex). They carry forward his Universalist approach to poetry which unveils an ordered universe behind the apparent chaos of world events. Nicholas Hagger is a poet, man of letters, cultural historian and philosopher. He has lectured in English at the University of Baghdad in Iraq and the University of Libya, and was a Professor of English Literature at Tokyo University and Keio University in Japan. He has studied Islamic and Oriental philosophy, and led a group of Universalist philosophers. He is the author of more than 40 books. These include a substantial literary output of 2,000 poems, over 300 classical odes, two poetic epics and 1,200 stories; travelogues; and innovatory works in literature, history and philosophy. Following his recent work in setting up a World State, which his two epic poems heralded, he was awarded the Gusi Peace Prize 2016 for Literature.